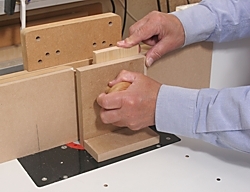 With router table work you often need to pass the workpiece vertically past the cutter. A tall table fence helps, but a vertical push block, pressing the workpiece against the fence gives maximum control of the material, keeps your fingers clear of the cutter, and helps reduce breakout. The vertical push block is an easily made work aid. 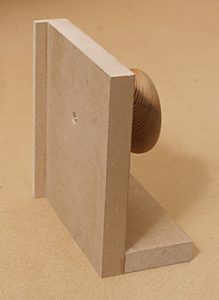 Mine is of MDF: 18mm for the main part and 6mm for the overhanging lip that pushes the work. 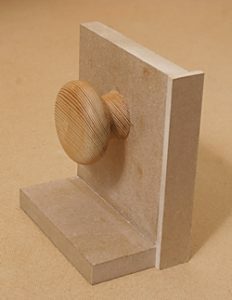 A doorknob as a handle completes the construction. Dimensions are not critical. The main part of mine is a 160 x 135mm piece of 18mm MDF with a 55 x 135 piece of the same material glued to it at right angles. A 160 x 30mm lip of 6mm MDF is glued to the rear vertical edge of the main piece, overlapping it by 12mm. The lip engages with the workpiece to push it past the cutter and minimise breakout. For a handle I used an old doorknob, held with a screw through the back. I find the shape easy to hold, but any kind of handle – or a simple wood block – would do. Additional push blocks with the overhanging lip to suit other board thicknesses can be made as required.